Barbara Ondo Designs is a residential and commercial interior design company located in Jacksonville and serving Central and North Florida. Barbara Ondo Designs has a website, which has not been updated in approximately 8 years and does not meet the company objectives. With advancing technology and the rise of social media, Barbara Ondo Designs needs to redesign their website to align with the goals of the business and the target audience. Barbara Ondo Designs needs a website that functions as a powerful marketing and educational tool to attract new builders/developers, business owners, and residential homeowners. The new site needs to be designed as to promote Barbara Ondo Design’s brand as an interior design firm that is a leader in the industry. 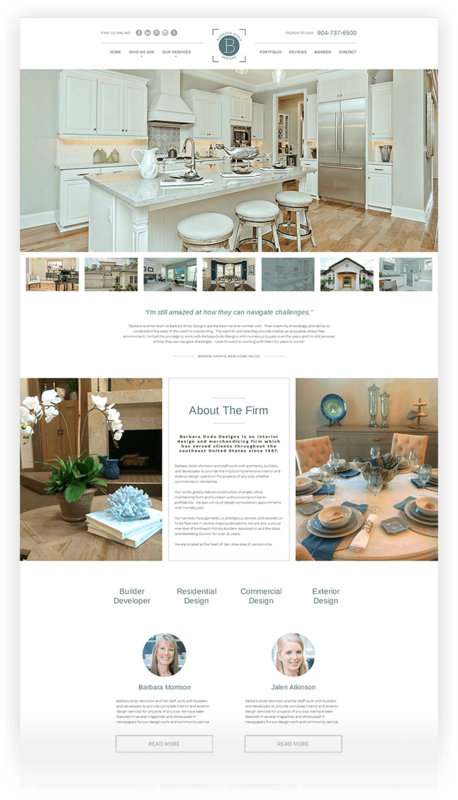 We created a completely new website, developed from the ground up, with a custom design to convey the interior design services that Barbara Ondo Designs offers to the community. The mobile-friendly website integrates with social media sites such as Houzz, Facebook, and Pinterest. It now provides customers with an easy to use navigation highlighting the beautiful portfolio of services Barbara has to offer.